Black Beauty is the story of a black horse in England in the 1800s. Written in 1877 by Anna Sewell, it tells the story from the horse’s viewpoint. The story covers Black Beauty’s life from the time he is born until his old age. 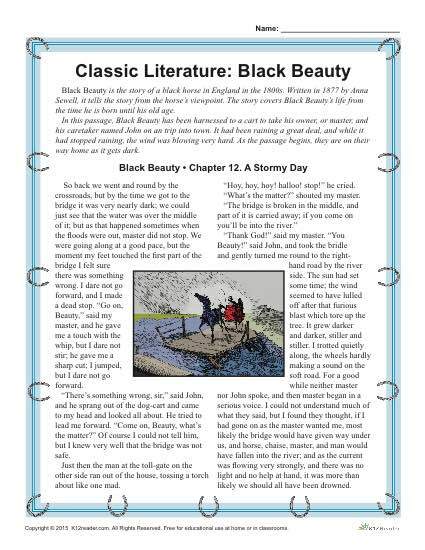 Students read a passage from Chapter 12 and complete activities about the passage: Black Beauty has been harnessed to a cart to take his owner, or master, and his caretaker named John on an trip into town. It had been raining a great deal, and while it had stopped raining, the wind was blowing very hard. As the passage begins, they are on their way home as it gets dark.